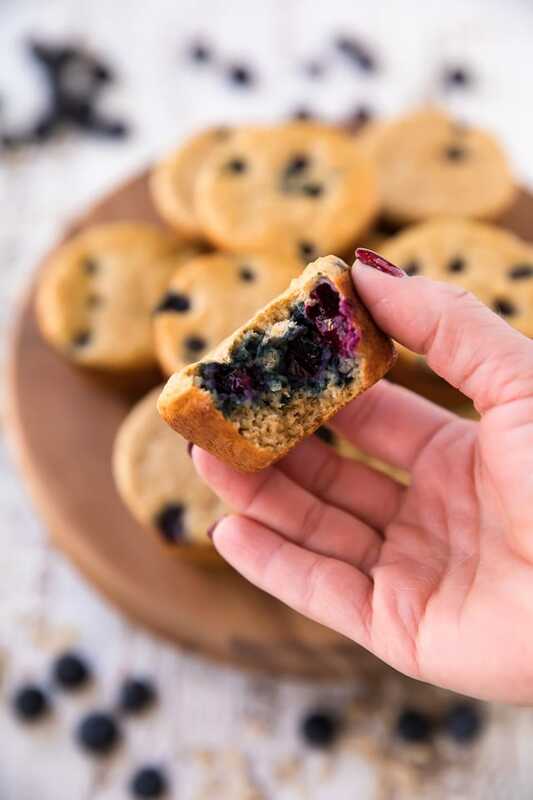 These Blueberry Banana Power Muffins are everything you could ever want in a blueberry protein muffin! They’re nearly fat free, less than 100 calories and packed with over 7 grams of protein and so much deliciousness. You won’t miss all the calories and fat, trust me! Not too long ago, I shared my Cranberry Apple Muscle Muffins with you. They were a HUGE hit with my family and you guys too! 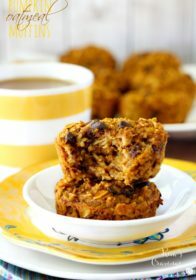 I love muffins and that recipe is one of my favorites. Unfortunately, cranberries aren’t available all year long. Since that recipe is so awesome, I decided we needed a new type of muffin from that base recipe. And that was the making of today’s incredibly satisfying, flavor-exploding Blueberry Banana Power Muffins! 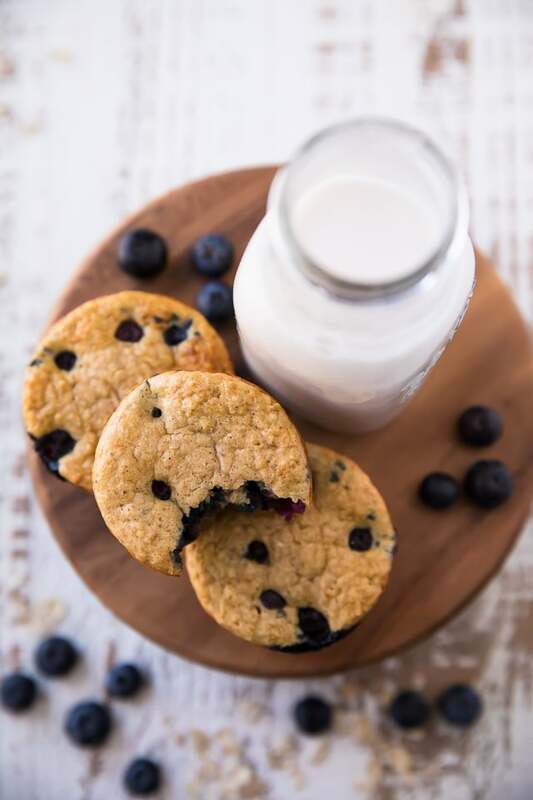 What’s so great about these Blueberry Protein Muffins? There’s so much awesomeness (is that even a word?) about these muffins. First– they’re flourless and made with oats. This also makes them easily gluten free – just make sure your oats are certified gluten free. They also contain no butter or oil, use a ripe banana for sweetener, have protein rich cottage cheese, and are packed with antioxidant-rich blueberries. And they are virtually fat free AND only 93 calories each. Pretty sweet, huh? You’re probably thinking – all that “health” talk probably makes these taste like health food, right?! Wrong. They taste soft, fluffy and light; exploding with juicy blueberries. You’re going to love them! What are you waiting for? Let your bananas brown, pick up some blueberries, and get to it! 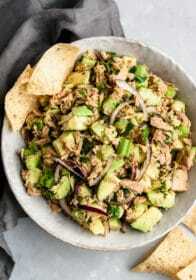 The recipe uses very familiar, easy ingredients. 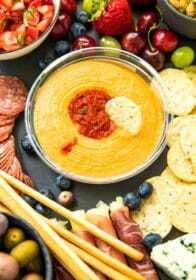 No mixer required, taking less than 30 minutes start to finish, they freeze well, taste phenomenal, low calories, minimal fat, no added sugar, are moist, soft, tender, skinny perfection. I could really go on and on, but you should really get to baking now! 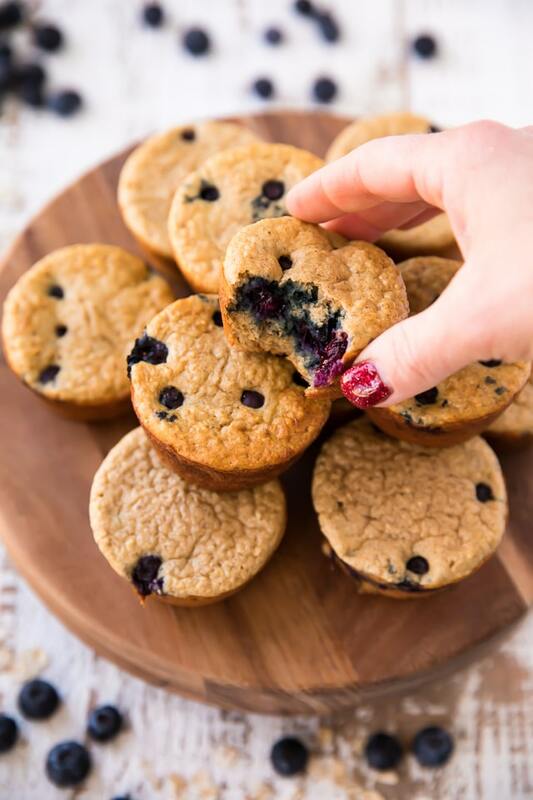 If you’re a fan of these Blueberry Banana Power Muffins, you’ll love my other favorites! I’d love to know if you make this (or any!) recipe! 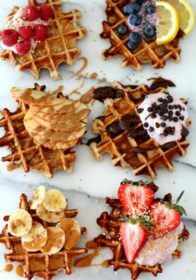 Tag @kimscravings on Instagram and Twitter, and be sure to subscribe to our mailing list to receive more delicious recipes straight to your inbox! Delicious, low calorie and protein-packed... what's there not to love?! Blend all ingredients except the blueberries in the blender and pour into well greased muffin tins. 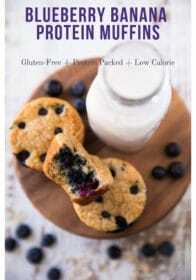 Press berries into the muffin batter dividing the blueberries evenly between all muffins. Bake at 350 degrees for approx 20 minutes. *I store these in a zip lock baggie in the fridge or freezer. To reheat, I turn the oven to high broil, slice, place on baking sheet and spray I Can't Believe It's Not Butter on each half. Broil for just a couple of minutes. The outer edges become slightly crisp with a tender center - so good! *Nutritional information is calculated using IdealLean Protein, but feel free to use your favorite protein variety. 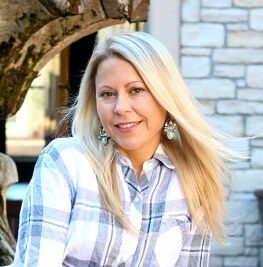 I also have had great luck baking with Tone It Up Nondairy Protein Powder. I always feel more powerful after a delicious breakfast. Or snack. Or dessert. Whenever these are eaten, I guarantee you they’ll be satisfying! Love! 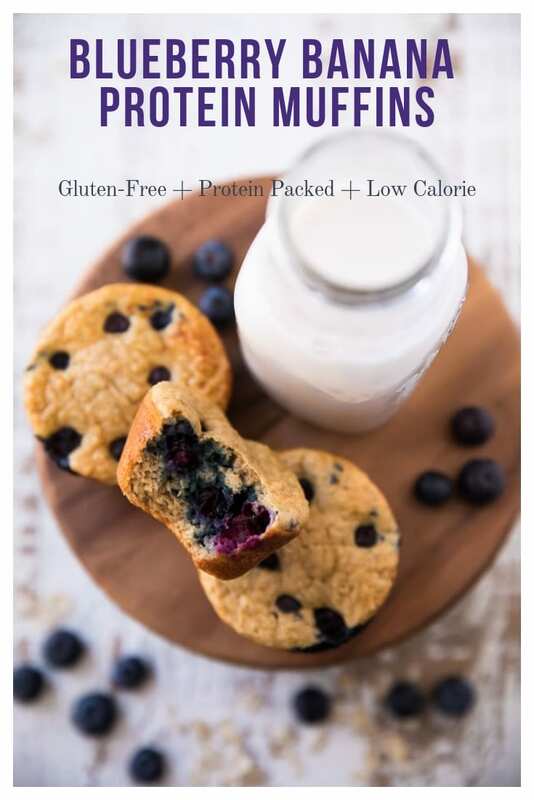 Mmm…these muffins look delicious! 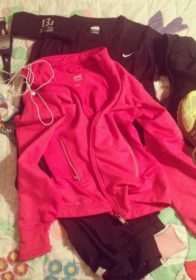 Can I omit the protein powder? Definitely! That should work just fine. Enjoy! 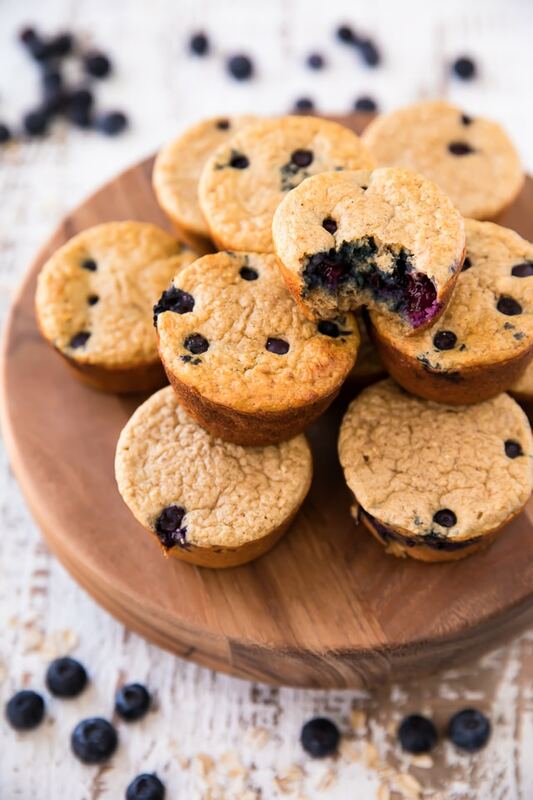 Your muffins are positively STUFFED with blueberries — the absolute best part of a blueberry muffin! 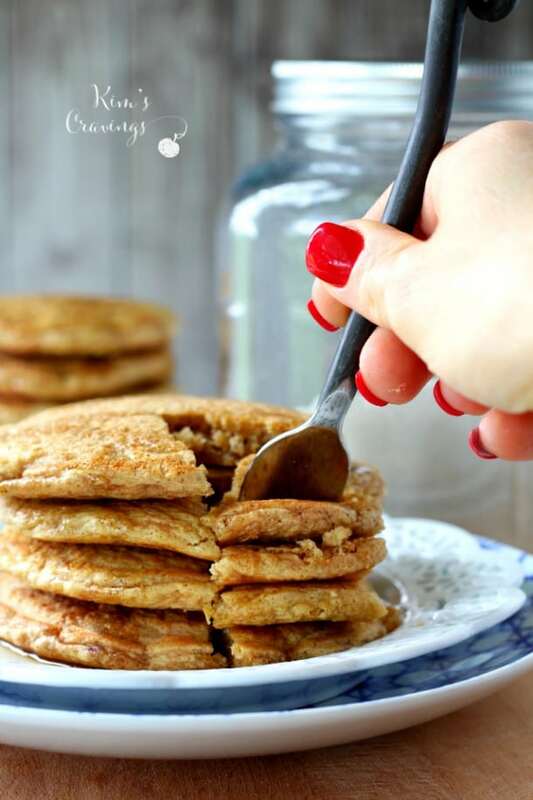 Love the oats instead of regular flour in your recipe too… I need this to fuel my workouts! Love how full of blueberries these muffins are! Saving this for my healthier morning recipes! Blueberry and banana just belong together! I can’t wait to try these muffins! 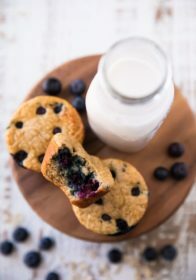 I love blueberries in muffins, and these sound tasty with the oats and cinnamon in there too. Hi! 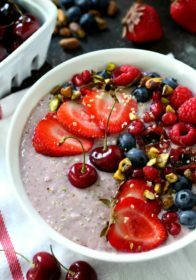 If I were to try and make this recipe nondairy, I would use a nondairy form of yogurt to replace the cottage cheese. I haven’t tried it, but that should work just fine. Enjoy!